In this section we offer brand new vending machines for unconventional purpose, machines of last generation and tehnology; over the years we have refined our catalogue of machines to make sure we only offer a selection of the best vending machines available. Nevertheless, trading brand new machines is not our core business, so we supply them only on demand, delivery taking up to 30 days time. 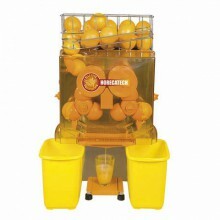 Orange juice machines for HoReCa use, model 'RS496', brand new - boxed. Ideal for oranges of 75-85 mm size in diameter. Motor power: 200W. Price without VAT.